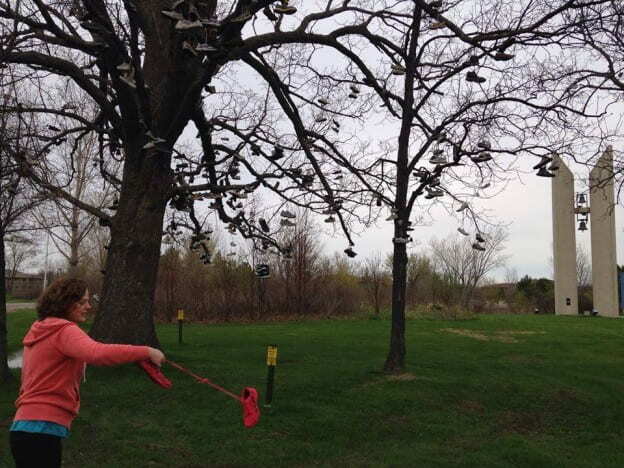 One tradition on the UWGB campus is for graduating seniors to throw a pair of shoes, some with personal messages, in to the Shoe Tree branches. The beloved 150 year old oak, housing decades of senior shoes, fell during a thunderstorm on July 30, 2002. On October 11, 2002, Shoe Tree II, was dedicated near the Ecumenical Center (now Mauthe Center). At the December 2002 graduation, Chancellor Bruce Shepard, presented Leanne Shaha, the 20,000th graduate, a wooden bowl he had crafted from the fallen Shoe Tree. We are hoping UWGB Alums can tell us more about this unique campus tradition. When did it start? What are your memories? Do you have a photo you could share? This content was originally posted by the UW-Green Bay Archives and Area Research Center to their facebook page on Thursday, May 15, 2015. View the original Facebook post. This entry was posted in Throwback Thursdays and tagged #tbt, shoe tree, Throwback Thursday on May 14, 2015 by Kimberly Vlies.